The main automaker introduced a new model designed for mega fast driving on the roads and not only. Ford Mustang GT is a special car that has a fairly large history and is produced for more than 50 years. The model in the add-on is not the last variation, but it's great for fast trips in Minecraft Pocket Edition. 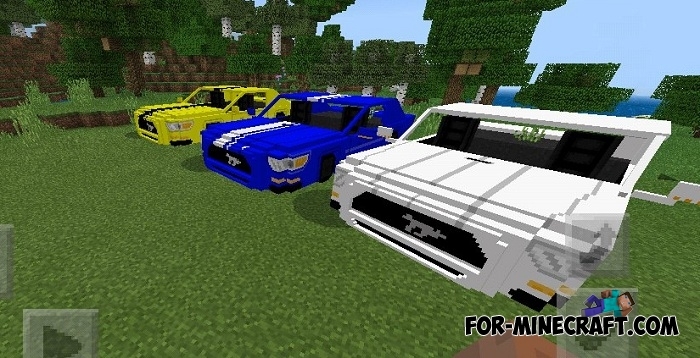 How to drive and how to get a Mustang GT? Everything is extremely simple: look for a car in small forests, on glades and lawns. The fact is that rabbits have become a prototype for this supercar, so you should look for them. Take the key and sit on the driver's seat, then change the first gear and start. How to install Mustang GT?